Visit Riva Faraldi in the hinterland of Cervo during your stay in liguria, italy. The small village boasts of its small, medieval alleys and houses. Serenity and tranquility are the number one priority here. You will find beautiful hiking and cycling trails around the locality. You will also find an ancient Roman bridge and an oil mill near the village. A theater festival takes place in the main town Villa Faraldi every year in summer in which the spectators are drawn to performances of all kinds under the spell of Ligurian culture. Whoever would like to relax and swim on the beach, is in less than 10 minutes there. Riva Faraldi is part of the Villa Faraldi municipality. The village was already settled in by the early Middle Ages. It became part of the Imperia Province and was allocated to the Cervo municipality. The idyllic mountain village has 193 inhabitants and is situated 166 meters above sea level. Holiday makers searching for tranquility will find this place, which is just 15 minutes away from the sea, a perfect holiday destination. 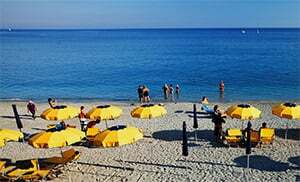 Riva Faraldi belongs to the Cervo municipality and is a village in the Imperia Province located in the Liguria region. There are several other villages near Riva Faraldi like: Deglio Faraldi (2.4 km) Villa Faraldi (3 km) and Tovetto (4.2 km). Take the highway exit to San Bartolomeo al Mare from Genoa and follow the SP34 to Riva Faraldi.